Sexual abuse of children by Roman Catholic clergy is perhaps the greatest scandal in the history of the Catholic Church in the United States. On September 7, 2007, the San Diego, California diocese settled with 144 claimants for $198 million. In mid-July, the Los Angeles Archdiocese settled with 508 claimants for $660 million. 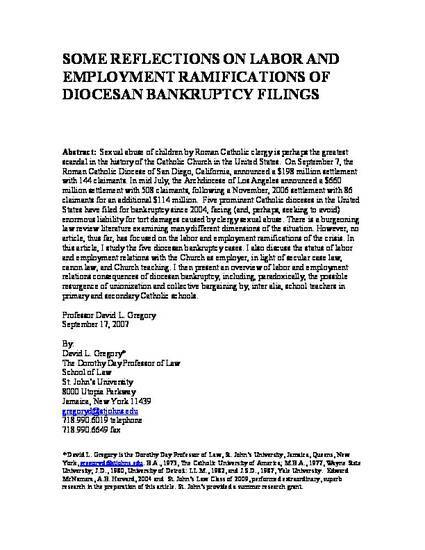 No article in the burgeoning law review literature on the scandal and its aftermath has focused on the labor and employment ramifications of diocesan bankruptcy filings. After first presenting the situations in the five dioceses that have filed for bankruptcy, I discuss the case and canon law regarding the labor management relations of, and with, the Church as employer. I conclude that, paradoxically, greater unionization and labor law rights may emerge, especially benefiting primary and secondary teachers in the Catholic schools. I have published dozens of law review articles since I began teaching here at St. John’s in 1982, after my graduate work at the Yale Law School. My c.v., including all publications and conferences and media appearances, are within.